This site has to be regarded as the quintessential meteorite crater on Earth. Located in the desert of Arizona, USA, it's actually the only such impact crater that looks like the ones on the moon. So, strictly speaking, this may not actually be prototypical of the craters on Earth, but nevertheless it looks so dramatic that it's become an icon, the most recognizable shape of its sort. It's been turned into quite a commercialized tourist attraction, with a rather oversized visitor centre, museum, cinema, offers of guided walks along the crater rim and an extensive souvenir shop. More background info: The impression of the crater is that it's indeed big – it's nearly a mile (1.6 km) wide and 570 feet (174 m) deep. The reason it hasn't eroded much – hence its moon-like appearance – is the fact that it is relatively young and that it lies in the middle of a dry desert. Other, much bigger impact craters around the world do not usually look anything like the moon's craters because they're older and vegetation and all kinds of erosion has changed their appearance so much that it is often not even an easy task identifying them. The Barringer Crater, however, was formed "only" ca. 50,000 years ago by a meteorite hitting the dry desert plain and leaving a model "moon" crater that is quite unmissable. The meteor(ite) that created the Barringer Crater consisted of nickel-iron weighing ca. 300,000 tons. Fragments of it were found up to 10 miles (15 km) from the crater. It's believed to have been ca. 150 feet (50 m) across when it was still in one piece – so not actually that large for a meteor, but it still gives you an idea of what damage a bigger one could cause! Combined with the impact speed, the force it had must have been the equivalent of well over one hundred Hiroshima bombs (or that of one larger H-bomb). The crater got its name from one Daniel Barringer, who in the early 20th century came to study the site (and dig for the iron!). He was the first to propose the theory that it may have been caused by the impact of a meteorite from space. Before, it had naturally been assumed that it was of volcanic origin – which made sense, since undeniably volcanic crater formations can be found not far away in the San Francisco mountain range. Barringer's impact theory long remained controversial, in fact it was largely rejected, until only relatively recently. Only from the 1960s did it finally become the universally accepted theory within the scientific community. One person who was instrumental in this shift in acceptance of Barringer's proposal was Eugene Shoemaker, who is best known for the joint discovery of the Shoemaker-Levy-9 comet. (Its fractured pieces dramatically collided with Jupiter in 1994 – giving scientists the first chance of observing such an event in the solar system "live".) Shoemaker had also conducted research at the Yucca Flats craters of the NTS, the USA's nuclear proving ground in the Nevada desert. He found that certain mineral formations also present in the Barringer Crater could only have been created by a kind of sudden shock compression that could not be the result of volcanism … but that did occur e.g. in ground explosions of atomic bombs. 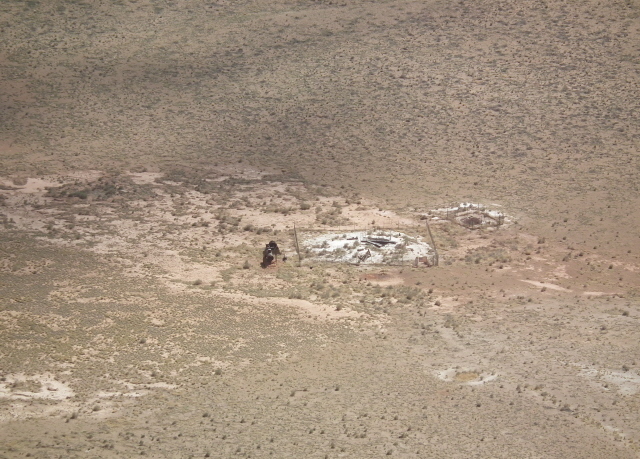 A prime example is the Sedan Crater at the NTS, which was formed as part of Operation Ploughshare, a test series intended to explore the possibilities of using atomic bombs for civil engineering (earth-movement) purposes. And the similarities between the Sedan and Barringer Craters are immediately striking. With the geochemistry confirming a similar sudden-shock origin for both craters, only the meteorite impact theory for Barringer's Crater was left as the sole plausible explanation for its creation. It has since been corroborated by all manner of other evidence and no doubt about it now remains. Today, the site, still owned by the Barringer family, is heavily commodified for tourism (though scientific research is also still conducted here) – and this includes quite a lot of dramatization to "sell" the story of meteorites and impacts in general to a public that is clearly eager to "buy" this. The Barringer Crater is actually included here as a dark tourism site simply for the reason that it gives visitors a dramatic impression of what forces are released by even such a relatively small meteorite. The next question, therefore, immediately crops up: what if a much bigger one were to collide with planet Earth? Could it wipe out civilization or even humankind in its entirety? … just as the dinosaurs were made extinct by the Chicxulub impact in Mexico that is widely assumed to have caused the so-called Cretaceous–Paleogene extinction event (that not only affected the dinosaurs but also many other species, including in particular plants). Given such horror scenarios, meteorite collisions have become a popular theme of disaster movies and sci-fi stories. That's what ultimately makes a crater such as Barringer a "dark" site too – even though it cannot have caused any human deaths at the time (humans only began arriving in the Americas much later), but was "only" a disaster for the flora and fauna around the site back then. But since it is the best preserved and most dramatic looking impact crater on Earth, it's been chosen here to represent the entire dark issue of (potentially) disastrous collisions of meteor(ites) with our planet. What there is to see: other than the big hole itself, not all that much, even though the Barringer Meteor Crater Company tries hard to supplement the crater by means of an exhibition, a film, talks, tours and, especially, a huge shop. First you have to ascend the stairs (or be lazy and take the lift) up the crater rim level. From the entrance it's another ascent up a long corridor before you get to the crater rim viewing points. You can view the crater from the shielded and air-conditioned interior through large windows, or you can step outside for a clear and unobstructed view of the big hole in the open air. There are viewing platforms at slightly different levels, some hugging the walls of the visitor centre building, some poking out over the rim's edge a bit to emphasize the impression of the depth of the crater. It is often very windy up here, so you may not even be able to use the trails that lead off along the rim from here. This was the case when I visited (in April 2012), when the wind was so strong that you could hardly stand upright in it – or take a steady photographic shot … I only managed from a shielded corner right by the visitor centre wall. The crater is just that – i.e. a very big nearly circular hole. It does look almost moon-like, except for the sparse vegetation that has managed to get a foothold inside the crater. At the bottom, roughly in the centre of the crater floor, you can see a few structures. 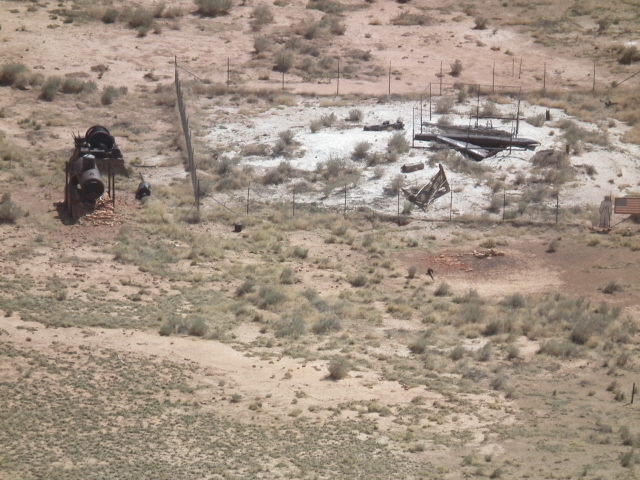 Apart from some rusting equipment (one piece looks like water tank) there are two fenced-in square areas around what clearly looks like mining shafts of some form or other. Look out for the cut-out shape of an astronaut and the US flag on one of the fences. These have been put up there a) to commemorate the fact that the crater was used by NASA in the training of Apollo astronauts, and b) to provide a sense of scale for visitors viewing the crater. The astronaut cut-out is about life-size and the flag is the exact same size as the flag left by the Apollo 11 mission on the surface of the moon. Inside the visitor centre, there's a movie theatre showing a somewhat over-dramatized film with lots of animations about the impact, as well as a bit of science (but not too much – visual and sound effects are the main thing). The 10-minute film is screened every half hour (on the hour and half past) and since it's included in the admission ticket, why not take it in. Lectures by a live guide are also offered in the theatre. Then you can explore the exhibition. The best bit is actually displayed just outside the exhibition space proper: the largest fragment ever found of the very meteorite that made the impact crater. It's a big chunk of iron, ca. one metre long and half a metre in diameter. Otherwise, the exhibition is necessarily rather short on artefacts. What else, other than pieces of space rock and perhaps scientific equipment, can you possibly put on display for such a topic? So the designers have tried hard to come up with an entertaining scientific "experience" kind of exhibition, and somewhat broadened the subject matter to include other meteor(ites) and astrogeology in general. Charts illustrate the trajectory, mass and speed of the meteorite that excavated the Barringer Crater, and various diagrams, tables and text panels explain the physics and geology of the site. Other impact events are covered too, such as the mysterious Tunguska explosion in Siberia, Russia, in 1908, which many believe may have been caused by a meteorite. Small fragments of various types of meteorite are displayed, and there are some hands-on interactive stations that may be particularly appealing to younger visitors. In one corner there is a mock-up of the Barringer Crater's floor against a large blow-up of a photo taken down there. Here people can pose for photos that look as if they had been taken down there – which is impossible in reality, though, since the crater floor is out of bounds to ordinary tourists. The rest of the exhibition turns to space and showcases, for instance, a "rogue gallery" of objects that might one day find themselves on a collision course with planet Earth. The collision of Shoemaker-Levy-9 with Jupiter gets some coverage, too, as do our closest neighbour planet, Mars, and Earth's own rocky satellite companion, the Moon. The training of Apollo astronauts in the crater for their moon missions is, predictably, yet another topic briefly touched upon in the exhibition. Outside, in the large courtyard next to the shop and cafeteria, a so-called "Astronaut Park" picks up the space exploration topic. There's an "American Astronaut Hall of Fame" and an Apollo training/test capsule. It's an add-on that remains a bit underwhelming in my view. The shop area, on the other hand, is overwhelming – by its sheer size alone. It must be one of the largest souvenir/gift shops I've ever encountered at any such site. One large section is actually a rock shop, the remainder sells tacky items such as coffee mugs, mouse pads, baseball caps and whatnot emblazoned with an aerial photo of the crater or with other related images/graphics. Also on sale are some books on the subject (and adjacent ones such as volcanism – ironically, given the history of the meteor crater's science). All these things are however outnumbered by unrelated general tourism merchandise pertaining generally to Arizona, the Wild West, Route 66 and general Americana motifs. This is continued beyond the shop by the nature of the on-site cafeteria (a franchise of one of those ubiquitous American fast-food chains … but no, in this case not the golden-arched kind …). All in all, then, this is an OK but hardly a top-league dark tourism attraction. The over-commercialization at the visitor centre can be a bit off-putting. But the crater as such is still quite impressive, and parts of the exhibition sufficiently illuminating (despite its overall rather gloomy lighting) to make a stopover here worth it when travelling through these parts. Whether it's worth a dedicated journey just for its own sake is less certain. You'd have to be a very committed aficionado of all things space-related for that. If you are, then of course it's quite cool. Location: the crater is located a few miles south of Interstate 40, by exit 233, 20 miles (32 km) west of Winslow and 35 miles (55 km) east of Flagstaff, Arizona, USA. Access and costs: only through the visitor centre for which a sizeable admission fee is charged. Details: the bad news first: you can't just drive up to the crater and walk to the rim for a free look. 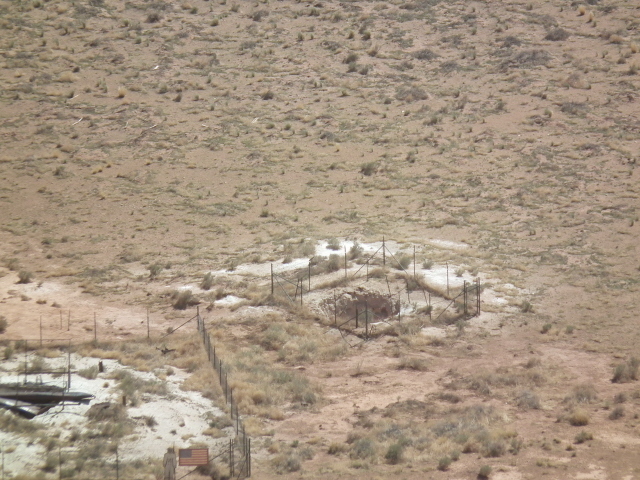 The whole crater is private property … surrounded by a fence. So you have to go through the visitor centre. Only from here can you access the viewing platforms and crater rim trails as well as the exhibition, movie theatre and other commodification. The crater floor is not accessible to visitors. To get to the crater and the visitor centre on the north rim independently you need to have a car. The only alternative is to go on an organized tour by coach from Flagstaff – there are packages are on offer that also take in the Petrified Forest and Painted Desert; for these expect to pay in the region of 100 USD per person. Directions are simple: the access road to the crater has its own exit, No. 233, from Interstate 40 (which goes east to west just north of the crater). Pass the caravan park and gas station and drive along Meteor Crater Road for ca. 5 miles (8 km) to the visitor centre, where there is plenty of parking space. Opening hours of the visitor centre: daily from 7 a.m. to 7 p.m. in summer, 8 a.m. to 5 p.m. during the rest of year. Tours of the crater rim normally take place (weather permitting) on an hourly basis, starting from 9:15 a.m. – the meeting point is by the large meteorite fragment outside the exhibition and movie theatre. Admission: 16 USD (15 USD for seniors, 8 USD for juniors between 6 and 17, under 6-year-olds free). This includes not only access to the exhibition and the viewing platforms but also the movie theatre. The guided rim walks do not cost extra either – but may be cancelled due to bad weather. Time required: that will vary quite a bit depending on whether you (can) go on a rim walk as well as seeing the museum and using the crater overlook. About an hour or so may do for the visitor centre alone. Add approximately another hour for a rim walk and extra time for the shop if you fancy a browse. Combinations with other dark destinations: nothing much in the bleak vicinity, unless you count its bleakness alone. There's also a stretch of the old Route 66 running parallel to Interstate 40 near the turn-off for the Crater. You can find some ghost-town-like ruins here, e.g. in a place with the evocative name Two Guns. Those who can't get enough of craters of all sorts can take in Sunset Crater north-east of Flagstaff. This is indeed a volcanic crater – or rather a cinder cone, to be precise – created in an eruption only about a thousand years ago. Further afield still, Albuquerque to the east is within a day's driving reach (for the National Museum of Nuclear Science & History), and so is Tucson to the south (for the AMARG boneyard and the Titan Missile Museum). Las Vegas to the west has a few darker attractions too (see under Atomic Testing Museum). Otherwise see generally under USA. Combinations with non-dark destinations: there's nothing in the bare and bleak environs of the crater itself, but Flagstaff, Arizona, is the nearest town of interest to tourists. Apart from its own merits (its old centre has some good semi-Wild-West charm), it is the perfect gateway to the Grand Canyon, some 80 miles (120 km) to the north, which is possibly the most celebrated National Park attraction in the whole of the USA. Because decent accommodation at the Grand Canyon Village itself can book out a long time in advance, staying in Flagstaff can be a better alternative if you can't get anything there compared to overnighting in the comparatively soulless motels etc. that dot the land just outside the National Park boundary. For those with a sentimental hankering after the good old days of road-tripping in the US the fact that Flagstaff is on the historic Route 66 may be another incentive for dropping by. For those with a special interest in astronomy, the famous Lowell Observatory on a hill just west of the edge of town is a must-see attraction – it was here that the (dwarf) planet Pluto was discovered (though it has recently been relegated out of the planet league), or the rings of Uranus, for instance. It has a visitor centre and guided tours of the observatory facilities are offered (11 USD, juniors 4 USD). Further afield, but still within easy day return excursion reach, there are numerous other cultural and natural attractions (too many to list here individually) that can warrant a longer stay in and around Flagstaff.